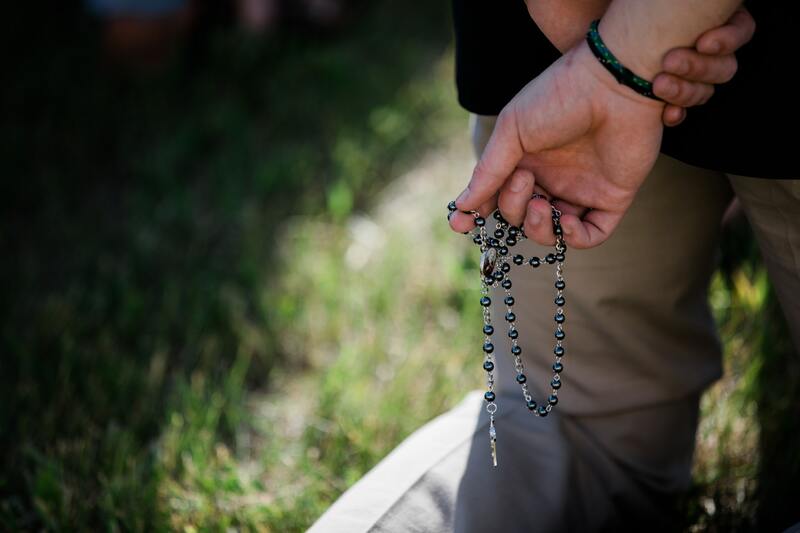 “The Rosary is the weapon for these times.”—St. Padre Pio. I’m a 29-year old Catholic with a wife, an eleven month-old daughter, and a son on the way. If you are like me, you look at the world we live in and are genuinely concerned for the family you are responsible for raising. While we live in an age of incredible medical and technological capability, “progress” and “enlightenment” have also brought darkness and confusion: The darkness of death and the confusion of relative truth. Countless books and articles have been written diagnosing the reasons for this decay, which St. John Paul II dubbed “the culture of death.” The reason for the ‘-isms’ with which we describe the cultural malaise—relativism, nihilism, hedonism, modernism—is the attempt of Satan to obscure and hide the message of the gospel: That Jesus Christ, the son of God, suffered, died and rose from the dead to save us from our sins and allow us to come back to the Father. It’s easy for us laymen to look to the hierarchy of the Church and our political leaders to “fix” the culture. But we have a weapon to fight darkness and confusion with, and that weapon is the Rosary of the Blessed Virgin Mary. I grew up in a Catholic family and went to Catholic school, so I’ve always had a good idea of the importance of the Rosary as a prayer. But I did not pray it regularly until after the baptism of my daughter, Madeline, a moment that was a conversion not only for her but for me as well. The Catechism of the Catholic Church says “The second conversion is an uninterrupted task for the entire Church” (1428) and likens it to St. Peter, who denied Jesus three times but was “drawn and moved by grace” to repent and affirm his love for the Lord (1429). Before Madeline’s baptism, I’d sought meaning and answers from largely secular sources: I’d recently read Dr. Jordan Peterson’s popular Twelve Rules for Life and Marcus Aurelius’ Meditations, for example. But after the baptism, during a visit to my parents’ house, I found a copy of Archbishop Charles Chaput’s Strangers in a Strange Land. Archbishop Chaput does an excellent job of describing the wrongness in our culture and presenting a solution for correcting it: live a Catholic life, by following the example of Jesus. This book made me examine my prayer life, which I realized was weak and stale. I needed structure, among other things, so I decided to begin praying a daily Rosary. The Rosary, like our Blessed Mother who conceived and gave birth to our Lord, is a prayer that leads us to Jesus. All Marian devotion, just like Mary herself, glorifies and praises her Son. We are called to bring the good news of Jesus to all people, and the Rosary is a prayer that focuses on Jesus! It involves meditating on his Incarnation, life, death, and Resurrection—and these events are the meaning and answer to everything and the answer to what our world needs. Young men search for meaning and purpose in all sorts of ideologies. But we Catholic men know that the world needs the Church, the Mystical Body of Christ, whose mission it is to make disciples of all nations (Mt. 28:19) and whose purpose is the salvation of souls. The Rosary causes us to focus on this mission. Why is the Rosary a weapon? We, the Church on earth, are the Church militant. Catholic men can appreciate this. We need purpose and we want action. We fight a daily spiritual warfare in our lives. The Rosary was given by Our Lady to St. Dominic to fight the Albigensian heresy and it was the cause of the victory of the Holy League over the Turks at Lepanto. Mary is often called the New Eve and she is depicted crushing the head of the snake. Asking her to intercede for us is a powerful prayer for our own battles against temptation and sin. The Rosary leads us to seek a life immersed in the sacraments and the Church. And this is its most powerful purpose: The Blessed Virgin Mary brings us to her Son, who lives in the Holy Spirit in the Church. Mary’s intercession does this and she proves it when she goes “in haste” to tell the good news of the Annunciation to her sister Elizabeth (Lk 1:39). Mary’s intercession prompted Jesus’ first miracle, when he turned water into wine at the wedding at Cana. She brought the Lord to the world and brings him to us now. When we make the Rosary a constant part of our prayer life, Mary’s prayer for us causes us to come to her Son frequently and receive his grace in the Sacrament of Reconciliation, to worship him in the Mass and receive him in the Eucharist, and to adore him in the Blessed Sacrament. Meditation on the scriptural mysteries of the Rosary brings us to the Holy Spirit, the Spirit of Truth. Times change but one thing remains constant: That Jesus Christ is the way, the truth, and the life (Jn 14:6). While he was in Athens, St. Paul preached to the Stoics and Epicureans the good news of Jesus and the Resurrection. They asked of Paul “What can this parrot mean?” (Acts 17:18 NJB). We can deduce that Paul must have repeated the message more than a few times to be called a “parrot.” The gospel is truth and it never changes. And for that reason, and because the Rosary is a constant and repetitive meditation of the gospel, it is the perfect weapon for our times. In Scripture, Jesus says that His Father brought Him His disciples (John 17:6-8). I don’t understand your general point, since it stands alone. If you are referring to the bad priests of our day, I would point out, that Judas was also a bad apostle of Jesus’ day. Pertaining to the Rosary, Mary brings our prayers to the Lord, similarly to the Angel Gabriel bringing Tobet’s son’s prayers to the Lord. She also loves us and magnifies our prayers by choosing to pray her own for us. She is Jesus mother; he loves her, and I do too. My comment merely said that God the Father is the one who draws people to His Son. It happens within the Godhead. It is not done by creatures of God. Creatures of God can only pray for us that it happens. Jesus is unique in the sense that He is the only person who is human, and also part of the Godhead at the same time. No one else is this way regardless of the honor that they have as humans. Creatures of God cannot be elevated to the place of being part of the Godhead. Because Christ Spirit can now be dwelling within us, we can have the presence of the whole Godhead within us because all of the fullness of the Godhead resides in Jesus (Colossians 2:9-10). This gives us personal and immediate access to God without any time-space consideration that we would have with creatures who are not Jesus. Our interaction with Jesus within us cannot be compared with anyone else because we can have faith in Him as a result of He being part of the Godhead. Did you know that the Spirit within us loves us and magnifies our prayers by choosing to pray His own for us? Romans 8:26 says: “Likewise the Spirit also helpeth our infirmities: for we know not what we should pray for as we ought: but the Spirit itself maketh intercession for us with groanings which cannot be uttered”. He is probably praying the same prayers that Jesus, our God-man intercessor, is praying at the right hand of the Father (Hebrews 4:14-16; 7:25; 10:19-23). Mary is the spouse of the Holy Spirit, so the two are one flesh. Where Mary is, there is the Holy Spirit…. The only one in the Godhead that has flesh is Jesus. When we have the Holy Spirit within us, we also carry Him everywhere. Whatever applies to Mary in this regard also applies to us. Humans can be partakers of the divine nature only insofar as we can partner with it. Vatican II’s Lumen Gentium 62 says: “Therefore the Blessed Virgin is invoked by the Church under the titles of Advocate, Auxiliatrix, Adjutrix, and Mediatrix. This, however, is to be so understood that it neither takes away from nor adds anything to the dignity and efficaciousness of Christ the one Mediator. For no creature could ever be counted as equal with the Incarnate Word and Redeemer”. However Mary is characterized, she can never be added to the Godhead any more than we can. Jesus is our One and Only Savior and He is Absolutely Eternally Patriarchal, in Absolute Communion with the Father, in the purest sense: by equipping, enabling and empowering us to be his eyes, ears, heart, hands, feet and voice to this rebellious world, to those in need and to our own need for daily conversion. We are instruments, servants, but also weapons because the reason Jesus came was to destroy the works of the devil (1 John 3:8). Jesus is no pacifist guru. He saves by destroying just like a doctor amputating off a cancerous tumor. The Most Holy Virgin Mary is the highest example of this Patriarchal Empowerment and Sword Wielding Church Militant. Jesus is the Commander In Chief, Mary is our Top General, Joseph our Master Trainer. Any devotion to Holy Mary that does not raise us both in humility and magnanimity to fight for God’s Honor is a false devotion. True Catholic Humility is profoundly, always and ever militant, always willing to die for the One who died for us. The Most Holy Mother is the one called by God to fight against today’s Satanic Marxist Tyrannical Matriarchy, which disguises evil as compassionate love, equality and superior intelligence. The True Mother Mary is the one ready to defeat the Impersonating False Mother Satan, who posed as our activist, “motherly compassionate advocate” in Genesis (Genesis 3:4-5) and continues today more intensely than ever before. For a clear secular insight into this fight check the video: “Jordan Peterson Vs The Tyrannical Matriarchy” in YouTube. Satan hates women, God’s Treasure on Earth, more than anything else, so he has turned many into evil weapons. We all, men and women, must allow the Sweet Warrior Queen Holy Mary to fight in us and through us. Pick up that Rosary and pray, even if all you can do sometimes is one our Father, one Hail Mary and one Glory be. Fight with Jesus, Mary and Joseph to crush the Serpent’s head (Genesis 3:15)!!! Amen! A few weeks ago I started praying the *entire* Rosary daily, all 20 decades (joyful, luminous, sorrowful, glorious). I was inspired to try it after watching Gabriel Castillo’s video on youtube titled “The Power of Praying the Entire Rosary” (GabiAfterHours is his handle on youtube). And I can report that there is definitely a new gracefulness and peace in my day. I highly recommend it!